The Dragon Coast consists of the lands and islands on the south shore of a branch of the Sea of Fallen Stars. It's more of a way of life than a geographical area for the three powerful city-states, seven or so major thieves' guilds, dozen pirate bands, and agents of Faerûn's darkest secret societies who live and work here. To outsiders who don't know how to play the game, the Dragon Coast is a nest of vultures and thieves located in the center of too many otherwise-ideal trading routes. To the initiated (canny Sembian merchants, shrewd rogues, and caravan masters who aren't afraid to grease a palm), the Dragon Coast is a perfect place to get things done ... to get anything done. As the Sembians say, "Everyone has a price. But the price is more reasonable on the Dragon Coast." Sidebar: The Dragons of the Dragon Coast. No one sneers at anyone else - but no one trusts anyone else, either. 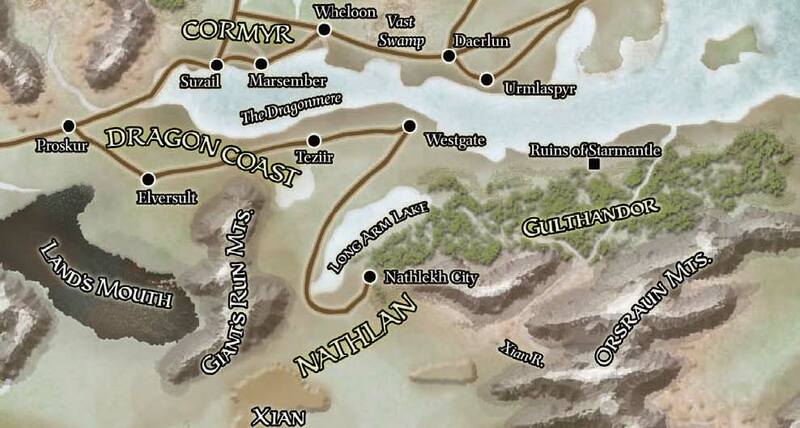 The veteran caravanmaster Gulkyn Drouthe of Reddansyr once described the Dragon Coast as "Waterdeep without guilds or Watch, and Westgate with its sinister powers reduced to the same swift blades and underhanded spells as the rest of us." A visitor here can expect to meet all kinds of beings, from drow and illithids to beholders and lizardfolk - and the usual poisonous array of unscrupulous mages for hire, doppelgangers and other shapechangers, and anyone on the run from justice elsewhere. There is no central government. Throughout much of the Dragon Coast there is no government at all or any law enforcement beyond hireswords and a general, unwritten code of conduct enforced by anyone who cares to take the time to do so. Few do unless they witness an offense that might be directly harmful to them: someone poisoning a well, for example, or using magic to destroy warehouses. All manner of goods constantly flow through the Dragon Coast. Only three groups of people command universal respect: the healers-for-hire (usually priests of Lathander, Shaundakul or Waukeen); the Waukeenar-sponsored moneychangers who are forbidden to practice swindles and deceptions; and the coopers and master shippers who craft containers for trade goods and pack them against heat, cold, wet, hard blows, and long falls. The most important Coast structures - and the only ones likely to be made of stone (aside from the walled cities) - are the warehouses. These are typically fortresses with watchtowers, slate roofs to discourage fire, and (to inhibit thieves' tunneling) concentric stone ring-walls. Many warehouses have undead guards (typically zombies, skeletons, and monster skeletons activated by opening the closets that confine them. A few boast sleep gas, spike-lined pit traps to capture intruders, and mimics or similar beasts among the stored goods. The natural geography of the Dragon Coast both isolates it and makes it an essential part of Faerûn-wide trade. Gulthmere Forest: This wide, tangled forest divides the Dragon Coast from the Vilhon Reach. It is a sprawl of rising uplands dotted with cedars and pines, eventually giving way to the Orsraun Mountains to the south. Gulthmere is noted for rich loads of mineral-bearing rock, particularly topazes and rubies, throughout its length. Prospectors and dwarven miners roam the wooded hills and challenge the native monsters and tribesfolk for the riches within. The lion-god Nobanion ceaselessly roams the wood to protect it. All the tribes of Gulthmere venerate Nobanion and call on the deity to halt invasions by greedy northerners. Pirate Isles: The Pirate Isles are a collection of rocky spurs dotting the sea some one hundred miles from the coast of Sembia. A great mountain known as the Dragonspur dominates the largest of the Isles, the Dragonisle (pop. 2,000). The Dragonspur shelters two excellent natural harbors that have been fortified, destroyed, and then fortified again by generations of pirates. Three other secure anchorages are scattered around the island. At any given time, between twenty and. sixty pirate vessels anchor here. Of these, 10% to 20% are beached, docked, or in dry-dock for repairs. The pirates of the isles lack the strength and unity to attack Sembia's ports directly, though they speak of such an operation constantly, encouraged by the legend of Immurk. The pirate king ruled from 1164 DR until 1201 and put Sembian cities to the torch even after they had paid him tribute. Sea of Fallen Stars: Also known as the Inner Sea, this huge body of water connects the east and west of Faerûn. Through the River Lis, the Inner Sea also connects with the Moonsea to the northeast. The Sea of Fallen Stars was the original migration route for the Chondathan humans who spread out from the Vilhon Reach and settled the center and north of Faerûn. Cormyr, Sembia, and to some extent the Impilturans, maintain powerful navies on the Inner Sea, but for the most part these are merchants' waters rather than warship domains. Undersea kingdoms of aquatic elves, merfolk, and sahuagin populate the Sea, but surface dwellers have little to do with them aside from violent flare-ups like the sahuagin attacks that battered the coastal human cities of both the Inner Sea and the Trackless Sea in 1369 DR.
Aside from the major cities, other communities are either too tiny (fishing villages, barbarian strongholds in the hills, or small farming settlements) or too transitory (smugglers' strongholds, pirate hideouts, pirate cities, and floating cities made of temporarily lashed-together pirate ships) to be jotted on a map. The Pirate Isles on the eastern edge of the Dragon Coast are thick with freebooters of all stripes, ranging from evil marauders who leave no victim unscarred to swashbucklers who wage personal wars against Thayan or Zhent shipping. Cedarspoke (Small City, 6,050): This quiet, independent city lies the in the heart of the Gulthmere Forest and is more often associated with the Vilhon Reach than the Dragon Coast. The Cedar River flows through the city and splits it in two. The city's inhabitants are druids or people seeking a simple, natural life. The druids of Cedarspoke are not part of the Emerald Enclave (see the Vilhon Reach), but they seldom oppose the Enclave's activities. The city's most notable landmark is Earthome College, a seat of druidic learning, and a repository for perhaps the best collection of historical documents relating to the Vilhon Reach. Zalaznar Crinios (N male human Drd17 of Silvanus) is the undisputed ruler of Cedarspoke, but he is an even-handed and popular tyrant. Elversult (Small City, 93729): Elversult is a rich community located south of the Dragonmere at the junction of many trading roads, including the Overmoor Trail and the Trader's Road. Although Elversult is not a port itself, its warehouses are the branching point for trade north to Cormyr and west to the Sword Coast. Elversult is the least Dragon Coast-ish city on the Dragon Coast. Its present ruler, a former adventurer named Yanseldara (NG female human Ftr11/Sor8) led a brilliant rebellion against the previous necromantic regime. Centuries of smuggling and intrigue cannot be undone in a decade, but those seeking dishonest deals now think twice before taking their business to Yanseldara's city, particularly since she leaves law enforcement to her consort and adventuring companion, Vaerana Hawklyn (CG female human Rgr20 of Mielikki). That does not mean that assassins, slavers, Banites, and cultists completely avoid Elversult - they simply cloak their movements with magic or operate under the cover of darkness. The Cult of the Dragon in particular has refused to relinquish the city as one of its staging points for operations to the south. Harpers and other adventurers frequently become entangled in thwarting the Cult's assassination schemes, drug running, and poison manufacturing - all of which are means toward their true goal of seeing Faerûn ruled by undead dragons. Ilipur (Large Town, 2,432) and Pros (Small Town, 1,924): These small ports serve as the loading and unloading points for Elversult. Neither town compares with the true ports of Westgate and Teziir, since shipments need to be loaded onto flat barges and poled out to waiting ships or into shore. Each town has its own Council of Burghers and mayor. "You can't smell the fish for the graft," grumble the merchants of Elversult, who have no choice but to pay the burghers what they want. The alternative is to let their cargoes fall completely into the hands of thieves' guilds such as the Purple Masks and Tide Flowers, or bandit-slavers such as the Men of the Basilisk. Proskur (Large City, 13,994): Proskur lies just outside Cormyr and the Stormhorn Mountains on the Overmoor Trail. Like most Dragon Coast trading cities, Proskur is run, by a merchant council. Unlike other Dragon Coast councils, Proskur's rulers are confessed thieves, former thieves' guild bosses who realized that they could become richer if they became the government instead of always fighting the government Ironically, Proskur is now known as a fairly honest region, in the sense that its ruling thieves are up front and efficient. Other covert operatives have difficulties evading its authorities, who have done it all before. The long-time leader of the Proskur council is a brilliant swindler named Leonara Obarstal (NG female human Rog12/Gld3). Reddansyr (Village, 608): A small town on the road leading to Starmantle, Reddansyr is known as an information clearing-house for adventurers. One might think that the town's fair-sized temple to Oghma would be responsible for this reputation, but the truth is that Oghma's priests are more tight-lipped than usual. Apparently, they resent the ongoing free information exchange that takes place at the Giant's Folly, a festhall located inside an overturned boat that was hauled inland by a fire giant who wanted to win a bet. Starmantle (Small City, 6,080): For centuries, Starmantle and Westgate have competed for trade moving across the Sea of Fallen Stars. Despite the cities' efforts to crush each other, neither has fallen. In fact, the competition has helped them both, since their price wars have increased the volume of trade moving through the Dragon Coast. Starmantle is somewhat less corrupt than Westgate, but it is deeply aligned with the pirates of the Isles. Teziir (Small City, 10,944): Built on the ruins of the previous city of Teziir, this city was founded in 1312 DR by a group of merchants who disapproved of Westgate's wickedness and wanted a port on the Dragonmere they could control themselves. The council of merchants continues to rule, maintaining power mostly because its members reward competent employees and terminate business relationships with those who fail them. Teziir subsidizes construction of temples and shrines to nonevil Faerûnian deities, believing that pilgrims, tithes, and occasional divine miracles are good for business. Consequently, the city has more than its share of temples and minor shrines, and clerics of nearly any of the divine powers can be found somewhere here. Teziir is also plagued by a thieves' guild known as the Astorians which has as many as seven hundred members and has been infiltrated by the Night Masks of Westgate. Westgate (Metropolis, 29,184): Westgate is the major trading city of the southern coast. It wields enough economic clout to make it the third major trading power of the Inner Sea after Sembia and Cormyr. The "anything goes and everything has a price" reputation of the Dragon Coast is directly attributable to Westgate, whose citizens are not ashamed of its reputation. On the contrary, they pride themselves on Westgate's status as an open city-open to all races, open to all faiths, and open to all coins. Westgate's noble rulers, all descended from rich merchant houses, believe that personal ethics may be fine for private life but have no place in business. Willingness to cut any deal has helped the city grow into a major economic power, but it has also created an environment in which thieves view their activities as extensions of normal business by other means. A thieves' guild known as the Night Masks controls nearly as much of Westgate as its official rulers do. The Night Mask assassins, extortionists, enforcers, and spies are for sale to any, meaning that the noble houses who ostensibly oppose the thieves' guild frequently its their best clients. Temples or shrines to evil deities, including Beshaba, Malar, Shar, and Talona, are sometimes "unmentionable" in polite Westgate society, depending on the fashion of the moment, but there's no doubt that they exist. They have as many devotees as the aboveground temples of Ilmater, Gond, Talos, Mask, and Loviatar (a favorite of several of the decadent noble houses). The newest addition to Westgate's parade of novelties is a gladiatorial enterprise named the Quivering Thumb, which fled from the collapse of Unther to the city whose rulers would pay the best for bloody circuses. The Quivering Thumb's new sandpit arena is popular with nobility, merchants, commoners, and even with slaves, because the Thumb promises freedom and a thousand gold pieces to any slave who can survive a year in the pit. The Thumb is regarded as a "fair-fight" enterprise, in which no side of any given battle is meant to be massacred. Humans began to settle the Dragon Coast about a thousand years before the beginning of Dalereckoning, emigrating from the realms of Chondath and the Vilhon Reach. Settlements of one sort or another have existed at the sites of the region's towns and cities ever since that long-ago time. The largest of these was Westgate, a human town ruled cruelly by the great dragon Kisonraathlisar. In -349 DR, the wizard Saldrinar of the Seven Spells destroyed the dragon and became the first human king of Westgate. He and his immediate successors set the city on the road to growth and power, but in -286 DR, Westgate was taken over by Orlak, the Night King. Orlak was a powerful vampire who ruled the city for more than a hundred years until the adventuring paladin Gen Soleilon overthrew him. Orlak died, but his vampire minions fled into the catacombs and selected a new Night King to rule the city's dark underworld. As Westgate's surface rulers changed with the passing years, so too did the Night King's line continue, even to the present day. More and more folk came to lands along the Sea of Fallen Stars, founding cities and realms. The Pirate Isles were settled by lawless cutthroats and corsairs who owed fealty to no king. In 257 DR, the pirates descended on Westgate and unseated its king, beginning nearly two hundred years of rule by the city's notorious Pirate Kings. Mulsantir Illistine, a Chondathan mercenary, overthrew the last of the Pirate Kings of Westgate in 429 DR. Mulsantir himself was overthrown in 452 DR by a Shoon wizard called Myntharan the Magus. Over and over again the lordship of Westgate changed hands, while the other free cities of the area grew and failed. The most notorious of Westgate's kings during this time was none other than Iyachtu Xvim the Baneson, who led an army of tieflings and demons against the city and ruled it in tyranny for twenty-odd years before the rightful heir, Farnath Ilistar, drove him out in 734 DR. In the Pirate Isles, small numbers of corsairs plagued the Inner Sea year after year, but none of these were of any great note until the rise of the first great pirate leader. Immurk began his career in 1164 DR. He fearlessly pillaged all of the powers on the Inner Sea and built up a corsair flotilla of more than a dozen ships. Immurk's agents spied out rich prizes in every major port on the Sea of Fallen Stars and fomented unrest across the region. Immurk died at the helm of his Sea-Scorpion in 1201 DR, fighting a Sembian warship. The growing power of the pirate fleets forced the great realms of the Inner Sea - Cormyr, Sembia, Impiltur, and others - into a temporary alliance in 1209 DR. The united fleets smashed the pirates in a great sea battle that left the Pirate Isles virtually empty for a century. In the Pirate Isles the corsairs have slowly rebuilt their strength. Dozens of pirate factions exist in and around the Dragonisle today, preying upon the commerce of the Inner Sea. But no other great leader emerged until the rise of a captain named Samagaer Silverblade in 1364 DR, the Year of the Wave. Samagaer appeared to be following in Immurk's footsteps, occupying the Dragonisle's largest harbor and gathering as many as a hundred ships beneath his banner. But in 1368 DR Silverblade disappeared, just in time to miss the disastrous battles with undersea creatures that hit the pirates of the Isles nearly as hard as it hit the ports of Sembia. There are rumors that Samagaer Silverblade's lieutenants, who still control half of his original fleet, take orders from him from wherever he is hiding. Only a handful know that Samagaer Silverblade is also the man who would be king of Sembia, the Silver Raven. The Raven makes much of his career as an adventurer, but only his most trusted associates have any idea that he was more successful than he has so far admitted, and that the Pirates of the Isles might be brought to his cause when he judges the time is right. It's a rare day when the Dragon Coast isn't crawling with plots and rumors. The Night Masks assassinate, intimidate, sabotage, and murder virtually at will throughout the region. The Fire Knives, members of an assassins' guild exiled from Cormyr, plot to retake the throne held by the Regent Alusair. And Sembian merchants smuggle and scheme in the ports of the region, hoping to make some fast gold in cities where few rules apply. Princes of the Night: A rash of vampire attacks plagues the powerful merchants and nobles of Westgate. The inner circle of Night Masks has taken a dark and perilous step indeed, and these predatory thieves have now become predators of another sort. The secret leader of the organization is clearly a powerful vampire wizard, supported by a cadre of vampire servitors who can strike anywhere in the city. The rank and file of the organization dare not protest, and the folk of the city can hardly move against the powerful and pervasive guild without provoking a bloodletting of ghastly proportions.